ISLAMABAD: Salahuddin, an Afghan national who sustained serious injures when he was allegedly pushed out of a moving taxi by two constable of Islamabad Police a couple of weeks ago near Sector G-9 bus terminal, died at the Pakistan Institute of Medical Sciences (PIMS) on Tuesday evening. The forty-year old Salahuddin has left behind his wife, six children, three sisters and a brother, all dependent on him. The forty-year old man has left behind his wife, six children, three sisters and a brother, all dependent on him. Salahuddin was living in Peshawar and had come to Islamabad to see off some relatives at the airport. They were going to the airport when the Islamabad Police constable, Saeed stopped them near the Sector G-9 bus terminal. Constable Saeed tried to take him to the Margalla Police Station in a taxi and somehow a scuffle took place, which resulted in Salahuddin being allegedly pushed out of the moving vehicle by the police officials. Salahuddin sustained critical injuries and was admitted to the PIMS where breathed his last on Tuesday evening. The dead body was handed over to the relatives today (Wednesday) at 3.30 p.m.
On hearing the news of Salahuddin's death, a large number of Afghan nationals, living in the capital, gathered at the PIMS and staged a protest rally against what they alleged inhuman treatment being meted out to all Afghans living in Pakistan. Activists belonging to Revolutionary Association of the Women of Afghanistan (RAWA) also joined the protest rally. A leader of RAWA said that agitators who gathered after hearing the news about Salahuddin's death wanted to approach the UN offices in the capital but the city police and administration prevented them from doing so. "We wanted to apprise them (UN agencies in the capital) of the humiliating treatment the Afghan refugees are being subjected to in Pakistan. We wanted to tell the world that not only in Pakistan but in Iran and in other parts of the world as well, the Afghan refugees are being treated very badly," said the RAWA activists. 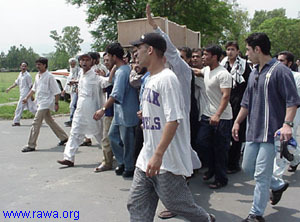 Afghans carrying the coffin out of the hospital protest against killing of Salahuddin by Police. Salahuddin is second Afghan killed by Islamabad Police in past few months. ISLAMABAD: Revolutionary Association of the Women of Afghanistan (RAWA) has strongly condemned the alleged murder of an Afghan national by the local police and announced to organize a protest campaign against it. An Afghan national, Sulah-ud-Din, who was allegedly thrown out of a running vehicle on June 17, succumbed to his injuries at PIMS on Wednesday morning. Talking to The Nation, a local leader of RAWA said that the incident has exposed the attitude of the government institutions towards the Afghan refugees. The RAWA leader came down hard on the government for forcefully extraditing the Afghan refugees from Pakistan.